An artist's depiction of the distribution of the gas surrounding IRAS 16547-4247. The center is thought to host multiple young, high-mass stars. Outflows of gas push outward from the center vertically and horizontally, creating an hourglass structure. 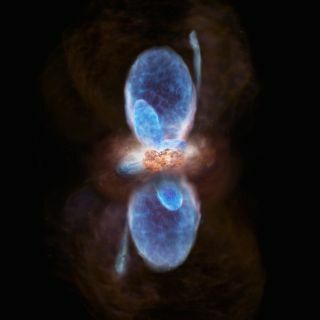 While probing the heart of a massive-star-forming region, researchers found an intricate surprise: an unusual hourglass-shaped structure carved by multiple jets of gas. The presence of the jets suggest the structure hides two bulky newborn stars at its heart. Although similar hourglass structures have been seen around low-mass star-forming regions, this is the first time one carved by jets of methanol has been detected in a high-mass-star creation region, and could help to probe these hard-to-examine regions, scientists reported in a new study. For the research, an international team of astronomers studied the birthplace of massive stars, called IRAS 16547-4247, using the Atacama Large Millimeter/submillimeter Array (ALMA), an enormous, powerful radio telescope in Chile. Because high-mass stars form in complex environments with multiple protostars — the clouds of dust and gas that ultimately form stars — that lie far from the Earth, the region has remained a mystery that only ALMA could solve. Scientists can study sunlike stars fairly easily, but stars with masses above 10 times that of the sun become more challenging to understand. While sunlike stars are close and plentiful, high-mass stars are distant and far less common. The closest massive star-forming region is the Orion Nebula, about 1,500 light-years from Earth. With its high angular resolution, ALMA can pierce the dust and gas around these distant star-forming regions and allow scientists to make detailed observations. Previous studies of IRAS 16547-4247, a luminous infrared source about 9,500 light-years away from Earth in the direction of the constellation Scorpius, revealed a pair of gas outflows thought to be emitted from a single star as well as several other radio sources, including a bright object at the center. While probing the dust with ALMA, the team found that the region contained two high-density compact gas clouds, each 10 to 20 times as massive as the sun. The astronomers think a newly formed high-mass star lies inside each of these cocoons of gas. ALMA showed that the previously identified outflows, which seemed to extend in the north-south direction, were actually two pairs of outflows — one set extending north-south and the other pushing east-west. ALMA also revealed new high-velocity outflows. Because a star can produce only one pair of outflows extending from its poles, the scientists concluded that the region hosts multiple stars in the process of forming. By tracking the methanol molecule, which traces the carbon monoxide flowing out of the region, the group determined that it produces an hourglass shape as it spreads outward from the center of IRAS 16547-4247. While such sights are often found around new low-mass stars, this is the first time such a structure has been spotted in a high-mass-star-forming region. "ALMA enabled us to see the complex formation environment of star clusters, which is even seven times farther away than the Orion Nebula with the highest imaging resolution ever achieved," Higuchi said in the statement. "ALMA will become indispensable for the future research on the high-mass-star-forming region." The findings were published in the Astrophysical Journal Letters in April.